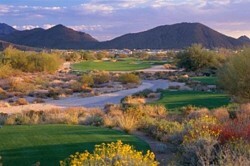 Troon Village is a 1,400 acre residential golf community located in north Scottsdale at the base of Troon Mountain. The community offers a fitness facility complete with tennis, swimming, and a sport court. Troon Village has a wonderful assortment of residential choices from townhomes to semi-custom and custom spec homes, as well as residential homesites. Golf course, mountain, and city light views are exceptional. Club & Golf Membership is separate from property ownership.